Are you proud of yourselves? Those of you who are perpetuating this whole “scary clown” thing – are you sitting there, smiling smugly at all that you’ve accomplished? I’m not sure what your motives are. 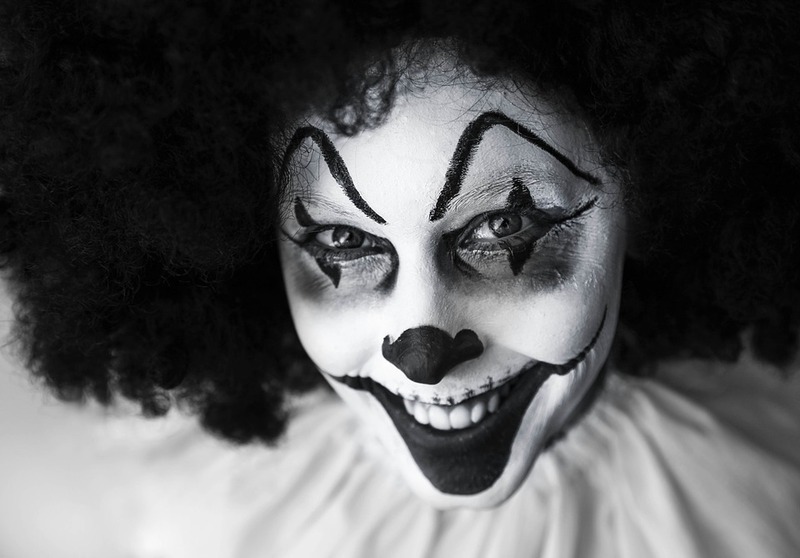 I’m not sure what possesses a person to wake up one day and think, I’m going to put on a clown costume and go out and try to terrorize people. And I’m not sure what possesses yet more people to think, hey, that looks like a great idea. Let’s join in. What I do know is that you are hurting people. Each and every one of you, whether it was a publicity stunt gone wrong or just a lark that you decided to participate in because you were bored and thought hey, it might just get you out of a day of school, you are hurting people. You are hurting people perhaps more than you realize. You may have been laughing when you first started this – finding it absurd that people would be afraid of someone in a clown costume. Just like the person who pops out from around a corner and says BOO to scare someone, you might have even thought, oh it’s just a moment of fright and then their lives go on. No big deal. Except that it IS a big deal. Schools are on lockdown because of your actions. I have been the teacher in a classroom filled with terrified kids on lockdown. It is a horrible experience for them to go through and one that stays with them much much longer than a simple little scare of someone yelling BOO! I’ve been that child too. I’ve been the one who heard about something in the local news who was then so tormented by it that she had to sleep in her parents’ bed. I was the child who had to have tranquilizers (yes, at the age of 9, I was on Valium simply because of something scary I had seen in the news regarding the FLQ Crisis that happened when we lived in Montreal) in order to make it through the day. I’m not sure you realize what you have started here. In this day and age, encountering people in costumes (outside of Halloween and masquerade parties) can be frightening. The world has been through such horror in recent times – so many acts of terror – that to see someone in a costume makes us wonder what they are up to. Why are they hiding their identity? You illicit an instant sense of distrust from us and distrust can be so dangerous. Distrust leads to tragedy. I’m holding my breath, just waiting for the first “Clown Killed” headline. Because what you might see as a lark, may just put you in danger too. I have friends talking about how their kids are sleeping in their beds, too afraid to be alone because a clown might get them. I have friends talking about how their kids’ schools are on lockdown or at the very least, having extra conversations with the students about how to stay safe. I have friends who really don’t have aggressive personalities, talking about what steps they will take to protect their children if one of you clowns comes around. We are just a few weeks away from Halloween. If my daughter was still a child, I’d be thinking long and hard about taking her out trick-or-treating this year. In fact, I’d be thinking long and hard about letting her go anywhere, even to school, without extra precautions being taken. And I know, without a doubt, that she would be sleeping in my bed every night and crying every morning, fearful about having to leave the house to go to school. I have seen people commenting that we shouldn’t be concerned about these “clown sightings”. They’re probably being exaggerated or are just harmless teenagers who think it’s funny. 1) In these times, can we afford to ignore it? Shouldn’t we be diligent with potential threats? I’m not proposing any drastic action or panic and I’m not going to lie awake at night worrying about the clown invasion, but you can bet if I see a clown lurking around, I will be concerned. We have no idea what ideas the copycats might come up with now. 2) This is not just harmless “fun”. Children are being hurt by it – not physically, but it’s hurt nonetheless. That time when I was 9 years old is something I still carry with me all the time. I don’t walk around in fear and I’m not riddled with anxiety because of it. But, it’s still there. There are times when it comes o mind and I remember it like it was yesterday. I remember the terror I felt in the pit of my stomach and for just a moment, my heart races and my breath quickens. I’m praying that this “Creepy Clown Crisis” comes to an end soon. I am hoping with every fiber of my being that no one else gets hurt by it, including the clowns themselves. And I hope that whoever is behind these events is thinking long and hard about what they’ve done. A world where people can have such disregard for each other, and especially for children, is a sad world indeed. Should Kids Learn to Tell Time with Analog Clocks?